I’m moving on up to teach Middle School next year, so this will be my last 5th grade science fair for the foreseeable future. After 8 years of overseeing these fairs, I’ve generated a ton of schedules, forms, letters, worksheets- all the structural stuff that I’m going to be passing on to my replacement next year. Unfortunately, no matter how much I want this transition to go smoothly- I realized today that the most important element of the entire fair can’t be forwarded in an email or printed out in a binder: it’s the careful coaching that I do with students in short face-to-face meetings over the course of the science fair preparations. Teacher: So what are you going to measure to compare the amount of rust? Students: How long the rust is. T: What tool are you going to use to do that? S: A ruler. With centimeters. T: OK- so let’s say your blob of rust looks like this (I draw a blobby shape on a piece of paper). How would you measure that? S: Like how long it is. From here to here (pointing at two ends of the rust). T: Why not here to here? (pointing at different ends of the rust). You see how this is going to be tricky? What if the rust looks like this (draw another blobby shape, smaller but longer)? Which blob of rust is bigger? T: But the second one is longer, right? So what else could you measure? S: We could do how long and how tall maybe. T: Length and height… so you would be figuring out area then instead, right? So instead of just measuring centimeters, you would be measuring square centimeters, like this (draw a square centimeter). But are your blobs of rust going to be perfect squares? S: No, but we could estimate it. M: OK, that’s a good idea, you could try to figure out how many square centimeters each blob of rust. So how would you figure out this blob (pointing at the first blob on the paper)? S: Like this (starts drawing square centimeters inside the blob), and count how many fit inside. M: Good thinking, but won’t that take a long time? Instead of drawing square centimeters yourself, is there a way you could use something with the squares centimeters already drawn on them? Like a piece of graph paper? How could you use that to make your measurements easier? S: (after some thought) We could trace the rust on the paper- and then just count them up! …But what about if only part of a square is full? M: Hmmm…. what do you think you should do? S: What if we only count the ones that are mostly full. M: That sounds like a good rule for estimating. I think you have a good plan now, why don’t you try it out and see how if it works? 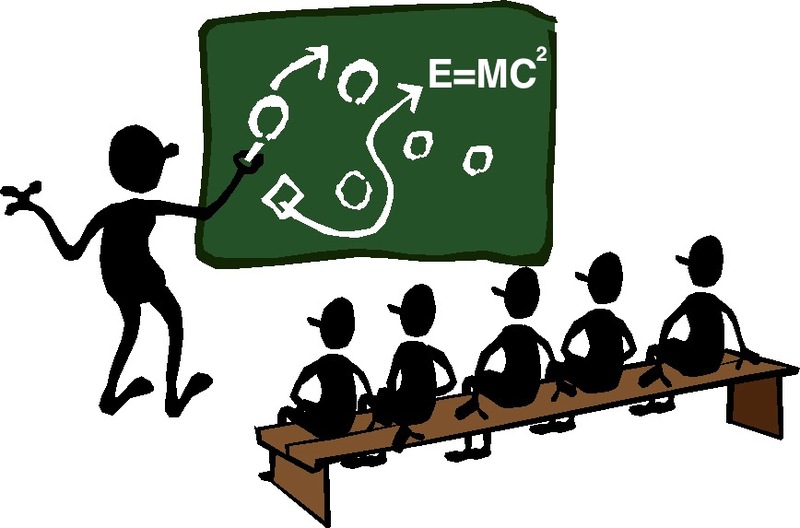 Leading from behind: The most difficult thing for me to learn as a science fair coach was how to lead a team of students without… err… leading. It’s a tricky tension: we want our students to be active learners and experience inquiry-based learning, but our students don’t have the skills or understanding to go the distance independently. So yes, the teacher still has to take the lead to guide students through the process, but it’s a subtle kind of leading puts the students out in front so they have a feeling of ownership and an opportunity to make decisions (and mistakes). In the example above, obviously the students are going to run into problems trying to measure the length of several irregular shapes, and there’s no point in having them waste hours of time doing that to “teach them a lesson” (if students spend hours collecting data, they will cling to it for dear life no matter how “bad” you may explain it is later!). Instead I have them think it through beforehand and come up with a better solution. Notice that I’m while I’m driving the conversation towards this solution the entire time, it’s the students that are actually making the decisions. The best analogy I can come up with is driver’s ed: the students are at the wheel, but all the while the teacher is there to keep students focused on what’s important, and if necessary you have the ability to slam on the brakes. Just right and just-in-time: My science fair coaching style is not a constant peppering of students with questions and suggestions- if you coach that way students will tune you out as faster than a nagging parent! Instead I pick 3 critical points to have these face-to-face conversations: when students have brainstormed their experimental questions, when students have written a rough draft of their procedure, and when they have collected their data (before analyzing it). That’s it. In between these points there’s plenty of modeling with exemplar science fair reports and example experiments in class, but the actual science fair work along the way is done without anyone looking over their shoulder. This way students truly do have ownership of their experiment, and have the opportunity to make plenty of mistakes! For example, the rough draft procedures are almost universally terrible when we meet- but that’s OK. As a teacher I can hone in on the most important issues to address, and lead from behind to guide student’s learning to improve their procedure before they start experimenting. Student-centered learning should be… STUDENT centered: The last important aspect of successful coaching is more of a philosophy than a strategy. As science teachers we can’t help but have an idea in our mind of what a perfect science fair experiment looks like… the kind that impresses the judges, wins the Google Science Fair and gets our name in the paper. Part of us would love to stroll through our science fair and see table after table of these perfect clones- wouldn’t that be a successful science fair? Maybe in a teacher’s eyes, but of course our real goal is student learning, and that will only be successful if that students actually have a chance to learn! In my mind the most successful science fair experiments are the ones that inspired the most learning and sparked the most interest in scientific inquiry. These may not be the ones with the most polished poster or the most “scientific” topic. In fact often these will be the experiments where the students ran into the most problems with their procedure or data. At the end of the day though, with careful coaching these students will have learned far more than by following someone else’s directions on ScienceFairProjects.com, and they will be able to demonstrate that learning by explaining the problems they overcame (and the ones they could not). getting knowledge everyday by reading such good articles or reviews.